Our "pet peeve" is seeing animals that don't receive the care they deserve! 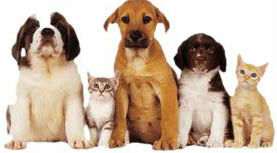 About 68 million dogs, 73 million cats, and countless other animals are owned as pets in the United States. At Market Compounding Pharmacy, we can prepare human medications in the right doses and more palatable dosages forms for your pets. How Important is Compounding for Pets? How often do you have to cut pills because they are manufactured as one large pill size with the "average-size" dog in mind? More often than not, these pill pieces are not going to be exactly equal in size. How often do owners complain that their cats have started foaming in the mouth because of the bitter pills that you've been prescribed and they aren't sure how much the cat actually received because some of it got spat out? Wouldn't you love a transdermal option for some drugs that are required for the animals that need treatment for chronic conditions? Owner compliance is the number one reason why pets do not receive the treatment necessary to obtain optimal animal health. By increasing owner compliance, it will allow for better treatment outcomes for these animals. The vet prescribed pills for your pet cat, Max, and the directions were to give it to him twice a day, for 5 days. He told you to just put it in his mouth and feed it to him. However, when you go home and try this, Max spits it out! You hold his mouth shut the next time, yet this still fails... he spits it out again! By now, the coating of the tablet is no longer intact and is dissolving in your hands and breaking apart. Max has already ran away, so what could you have done? Maybe you can try putting it in his food dish. Then you notice he has eaten all around the pill and left the pill in the food dish. This doesn't work either. Wouldn't you love a tasty tuna flavored pill so Max would eat it without a fight? Our compounding specialists can help. Dosage Strength - If the correct strength is unavailable. For example, a medication which comes as a 50mg tablet can be compounded into a strength required for small pet dosing, such as 10mg. Flavoring - Flavoring is very important, especially with cats. Therefore, we can take a drug with a very bitter taste (i.e. Metronidazole) and compound it into a sardine or tuna flavored suspension with cats love. We can also compound drugs to have a sweet taste, which dogs enjoy. Dosage forms not commercially available - If a medication is no longer available in the United States, such as PZI, it can be compounded. If your pet is poorly tolerant of oral medications, an alternate route of administration can be prepared. What is available for veterinary compounding?